Another dress rehearsal with three new elements. What’s new and different in this table setting are the Venetian goblets, the Mottahedeh porcelain, and the silver mint julep cups. I ordered my goblets while on vacation in Venice, and they are by far my favorite. But unfortunately, after eleven years of use, I only have a few left. I am currently trying to reconnect with the Murano shop where I purchased them and my chandelier, but their website has disappeared. 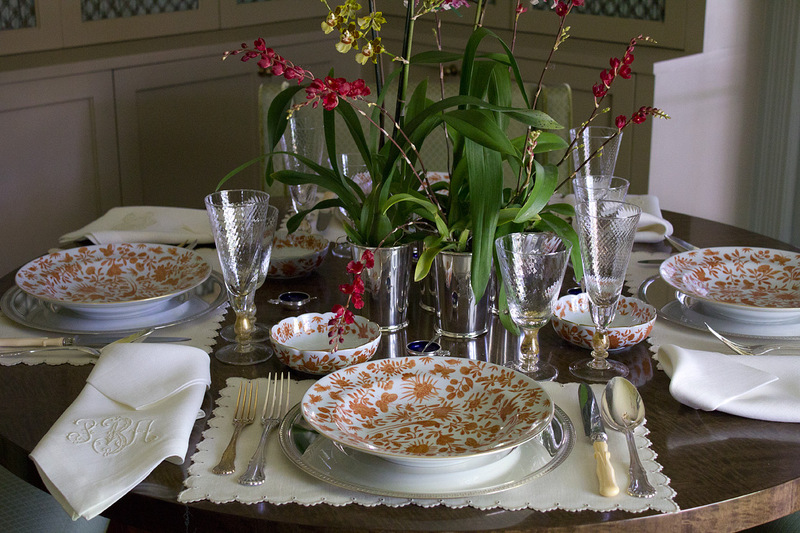 The Mottahedeh porcelain, Sacred Bird & Butterfly, is a reproduction of the original Chinese export that sets the dining room of the famed Nathanial Russell House. The Chinese word for butterfly, “tieh”, is a pun which expresses the wish that the owner might live to a ripe old age. Since my parents’ wedding porcelain is so simple, I wanted to have this decorative option to set my table with. 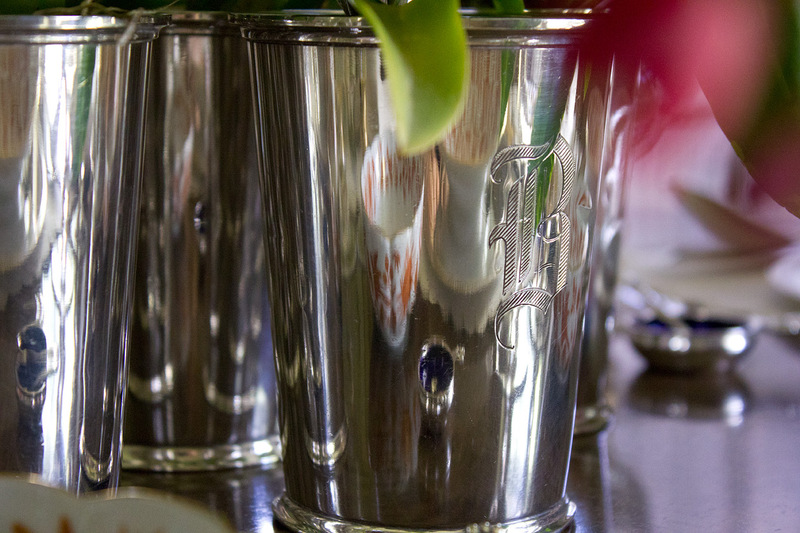 The centerpiece is made up of six orchid plants each set into its own silver cup. These mint julep cups are also from my parents’ estate. In some of the following photos, you might be able to make out the engraved “B”. (above) Now you can see the entire centerpiece. 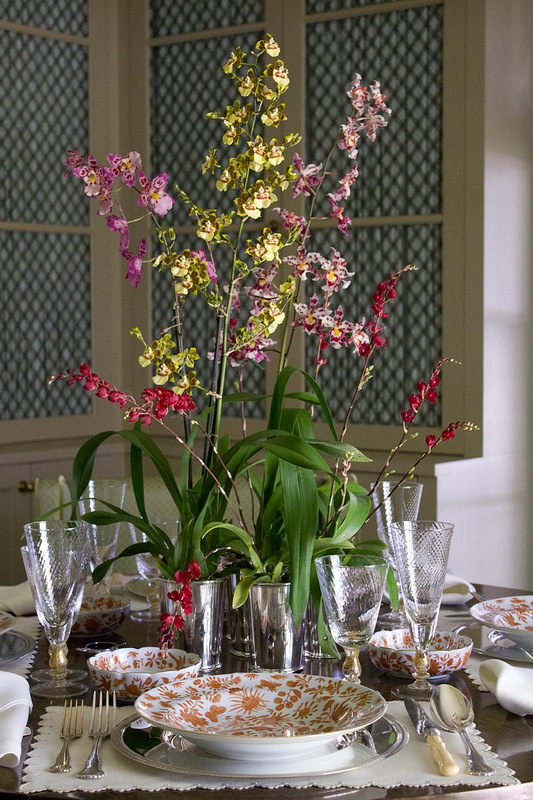 I purchased these orchids at Nicholson-Hardie and just dropped them, pot and all, into the silver cups. It was a quick easy solution with no fuss or muss. (above) Now you can see most of the table top. I purchased the Sacred Bird & Butterfly porcelain through Neiman Marcus Gift Galleries. (above) I don’t think my parents ever used these mint julep cups. Two were still in their packaging when I came across them. Lovely. You set a gorgeous table. I do not know this Mottahedeh porcelain pattern. They have a blue dragon that I rather like. 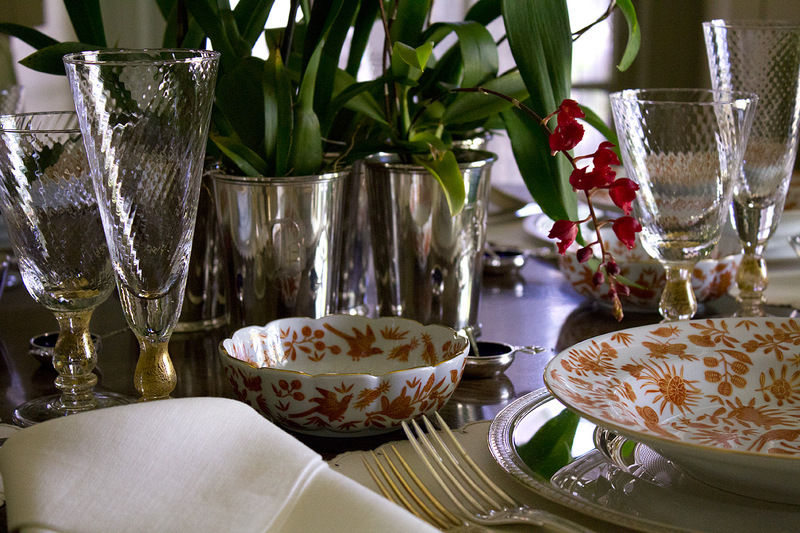 Fabulous contrast to the simplicity of your parent’s Lenox. Are those blue enamel salt cellars, Patsy Ann? Margaret, yes they are enameled salt cellars. They formerly belonged to my maternal grandparents. They are Georg Jensen sterling with tiny spoons to match. So beautiful. Poetry on the table. Previous post What? Another One?